The Bombay Sapphire Gin Distillery at Laverstoke Mill in Hampshire is the first distillery and also the first refurbishment to achieve an ‘Outstanding’ BREEAM design-stage accreditation. The distillery process buildings designed by GWP Architecture have been awarded an impressive score of 86.81%, the second highest score for an industrial building by BREEAM. The accolade comes after a careful process that analysed contextual, economic, efficiency and technical feasibility complexities around the site by the design team. The restoration of the site also includes the installation of a combination of on-site renewable energy generating systems, such as photovoltaics, a bio-fuelled boiler and 6kW hydro-electric water wheel in the river Test. 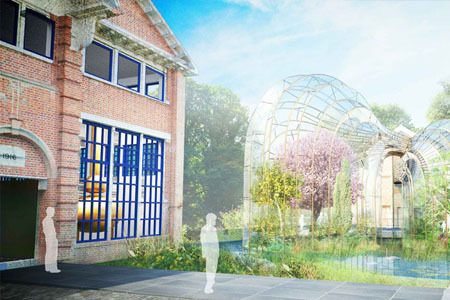 The distillery is set to open in Autumn 2013 and will include a visitor centre and botanical glasshouses designed by Thomas Heatherwick and his team at Heatherwick Studio. The site is being renovated from a derelict mill into a state-of-the-art premium gin distillery and visitor centre encompassing the highest standards in design, functionality and sustainability. For further information have a look at the project page.